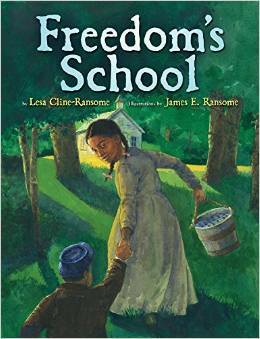 Freedom's School takes place the day after slaves were freed. Although slaves were free, it may not be "real freedom," if one was not educated. We are introduced to Lizzie, her brother Paul, and her family in efforts of going to school for the very first time. When arriving to school, Lizzie's impression of it was pretty despite the school building being raw and not decorated. Soon, children started to fill up the building and Mizz Howard, the teacher, introduced herself. However, at this time, school was not always routine. There were times when Mizz Howard would send students right back home after arriving to school, stating there was nearby danger. Other times, many other students would have to miss school because of the weather or work. School was not always a safe place, and eventually the school was put on fire. Although the school was burned down, wanting to learn did not, and school was rebuilt with hopes. The new school was named Freedom's School. Freedom's School demonstrates Element 3: Exploring Issues of Social Injustice of the 6 Elements of Social Justice by illustrating racism and oppression during the emancipation. Throughout history, slaves were not treated as people, and even after slavery ends, these people were still not treated as whole human beings. We are introduced to Lizzie, her family, and her community in wanting to educate and expand their current knowledge. However, as stated in the story, going to and being in school was not safe. Other times, financial and basic needs would get in the way of education, such as needing to work and helping family at home. There seemed to be a lot of hate as evidenced by the burning of the school building. Despite this tragedy, the whole community is seen rebuilding the school, and this is where we see the strength in this community and its value regarding the importance of education. This book introduces injustices that are mentioned in textbooks, but lacks a connection regarding circumstance and feelings during that time. Students of first and second grade may be the best candidates in using this book especially when discussing the topic of emancipation, however this book may be used for all ages. First and second graders may better understand that people from history are real people instead of just events. By better understanding the circumstances of people at the time, a better connection to the present school system, for example, may occur. By better understanding the circumstances of the past, one can better point out injustices and why. Students can then think of means of how things got better and what injustices still exist. An activity may include comparing and contrasting injustices found in the past, first to themselves and then sharing it with the whole class. Students will be asked if this injustice has been solved. If so, in what way? How has it affected the present? If the problem has not been resolved, how has it affected the present? Will this further affect the future? Students will then be put in small group to further expand their research and experiences. The teacher will determine the level of rigor regarding this activity. If extensive research is done, small groups may be asked to present and "teach the class" regarding their findings and ideas in a number of ways including the use of paper and pen, arts and crafts, media, etc.